These perforated interlocking trade show tiles feature a distinctive inwardly diagonal web design, which gives the illusion of being bicolored and checked. These modular trade show tiles make a great portable floor for a convention booth or product display. They are available in a variety of colors, and the different colors can be attached together to create colorful patterns and designs. Furthermore, if you are interested in having a logo printed on the portable tiles, we can create custom tiles for you. Their size makes them easy to deal with, 12” x 12” x ½”, because they are easy to carry, assemble, and disassemble when it is time to pack up and move on. They are lightweight and durable and can be reused over and over, which makes them a very smart investment that you can use year after year. 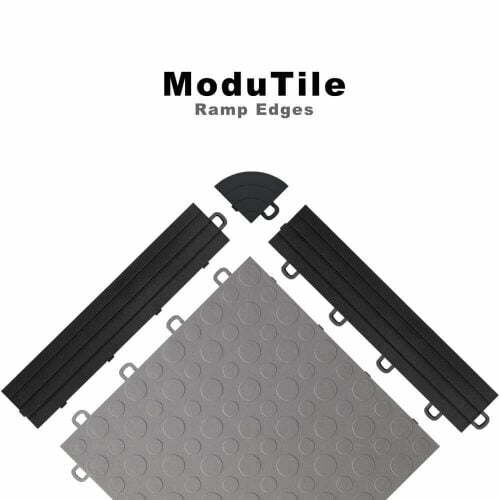 Why are the ModuTile Perforated Trade Show Tiles Perfect for Event Flooring? They are lightweight and easy to assemble. The unique mesh surface makes them slip resistant. These interlocking tiles support heavy weight including vehicles. They are easily portable and reusable. Their rigid structure makes them strong and durable. 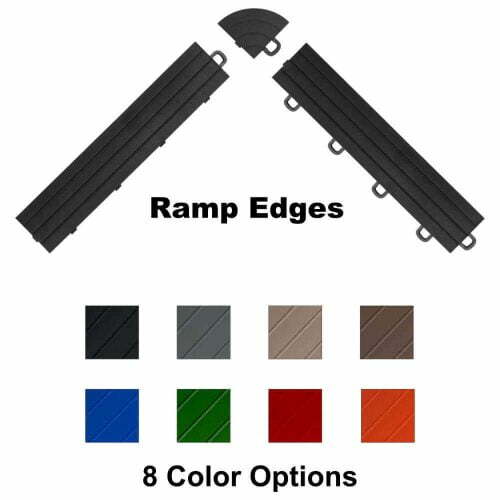 Ramp Edges Available to create a mat of any size for trade show events. They are stain-resistant and easy to clean. 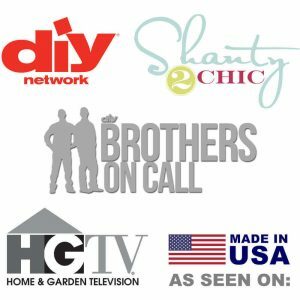 They are proudly made in the USA. Perforated Tiles offer extra air and water flow for many other uses. 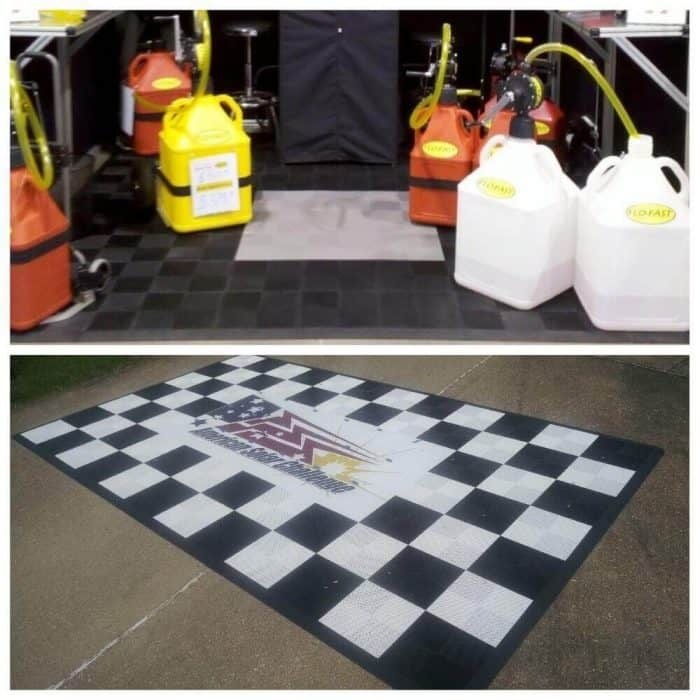 ModuTile proudly offers custom floor graphics on our coin top interlocking trade show tiles to take your product display to the next level. We can customize the modular tiles with your logo or special message to really give you an aesthetic edge over any competitors. Adding graphics to your trade show floor tiles will greatly enhance visual recognition of your business and capture your customers’ attention. The tiles are made of a high-impact polymer that is extremely difficult to stain, which makes the trade show tiles an excellent choice for your special event. Most common materials will not bond well to the polymer, so the tiles are easy to keep clean. 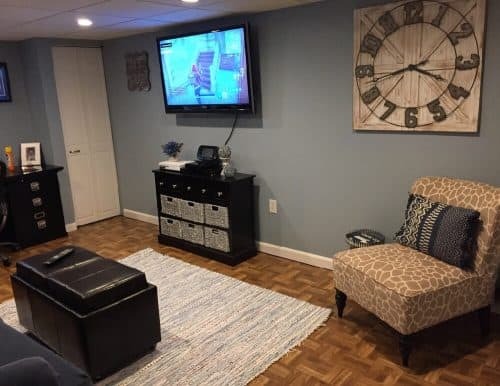 As needed, you can simply wipe the interlocking tiles of any dirt and wash them with a mild soap and water solution and a soft rag or damp mop. The tiles are made from a high-impact polymer material that is lightweight and strong enough to support heavy loads like tables and chairs or displays for your trade show. They can also support cabinets, furniture, vehicles, boats and much more. Please note that pinpoint weights may damage the tiles as far as their color. Heavy loads with high pinpoint weight may cause discoloration. Plywood or another protective flat rigid surface should be used when the tiles will be supporting sharp heavy objects. The diagonal web surface pattern looks great, but it also provides an extra level of safety when walking on the trade show tiles because it can prevent slipping. 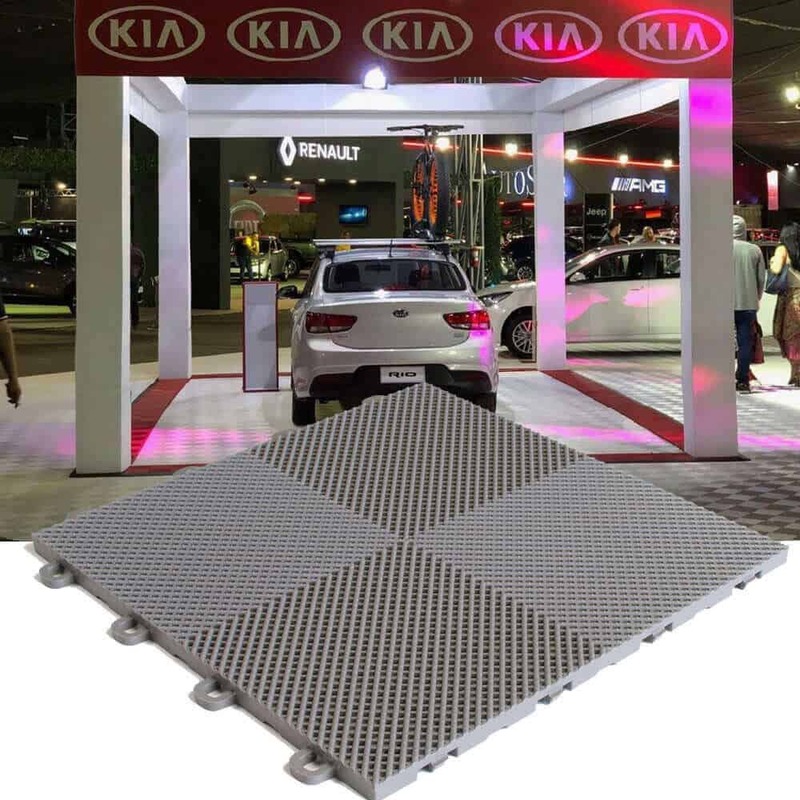 These tiles are also well suited for use for a product display because the perforated design is slip resistant. For ease of assembly, the 4 loop-to-peg interlocking system snaps together without the need of tools. Two sides of the tiles have loops and the other two sides have pegs. They interlock like puzzle pieces to form any size event floor. Similarly, the tiles may easily be disconnected and removed when it is time to leave. Our specially formulated high-impact polymer is rigid (hard). 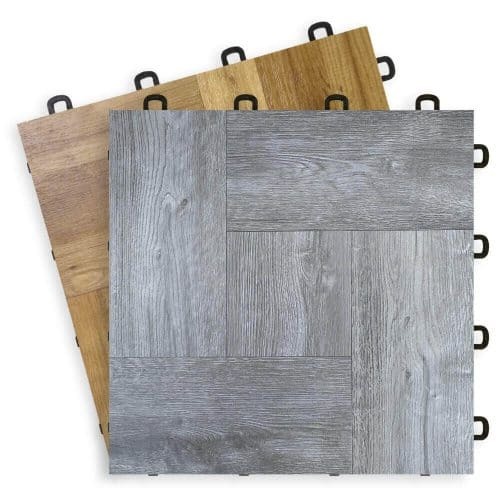 When the floor tiles are interlocked together to form a floor, the result is a strong solid surface that will support the weight of heavy objects. Unfortunately, the structure of the tiles does not accommodate wires or cords to run under the tiles. You would have to lay the cords or wires over the tiles and tape them down to the top of the tiles to prevent a tripping hazard if needed. 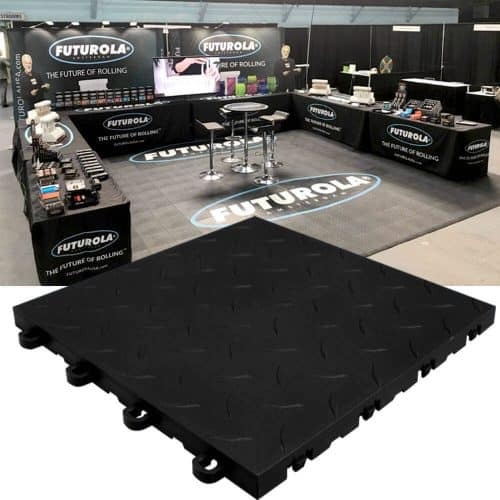 Another benefit is that if the venue floor has cracks or imperfections, the trade show or event flooring that is formed on top after the tiles are installed looks perfectly even and attractive. In other words, it effectively covers an ugly and imperfect venue floor. We offer multiple colors of Perforated event floor tiles, all made in the USA. Different color combinations of the can be used together to create various patterns such as borders or checkerboard designs for your trade show. 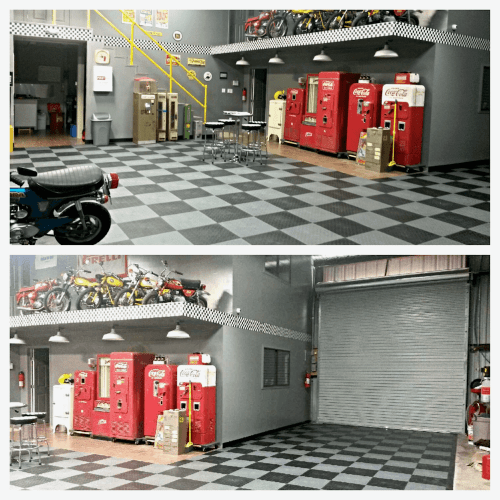 Although the Perforated tile is an excellent choice for trade show and event flooring, it can be used in garage settings too. Its physical structure makes it just as useful in many other environments. The high-impact polypropylene tiles are made with UV protection, so they can offer the perfect solution for an outdoor patio or driveway. Since the Perforated tiles are also water resistant, they can be used by a swimming pool or a cabana area, outside, as well as indoors. We used over 6000 sq ft with gray and we got so much attention to out booth.